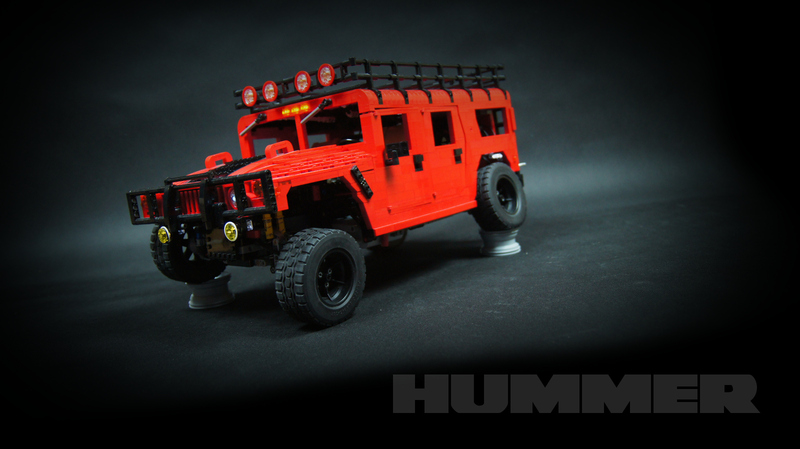 Large model of the iconic Hummer. 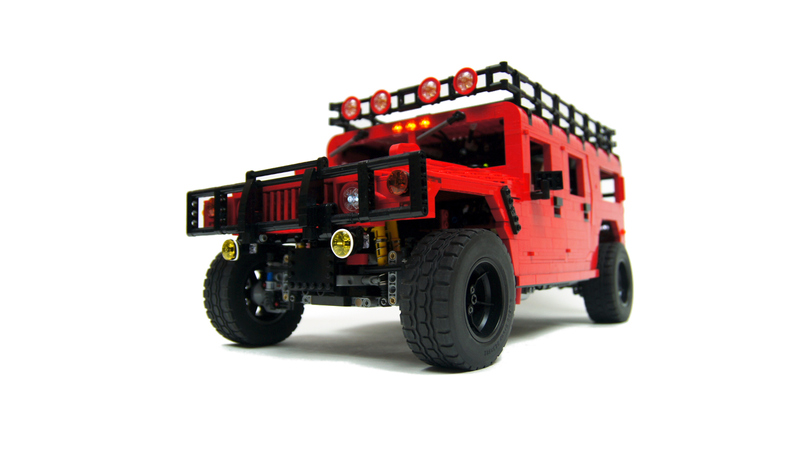 Features 4×4 drive, full suspension, 2-speed gearbox, windshield wipers, lights, turn signals, reverse lights and custom stickers. 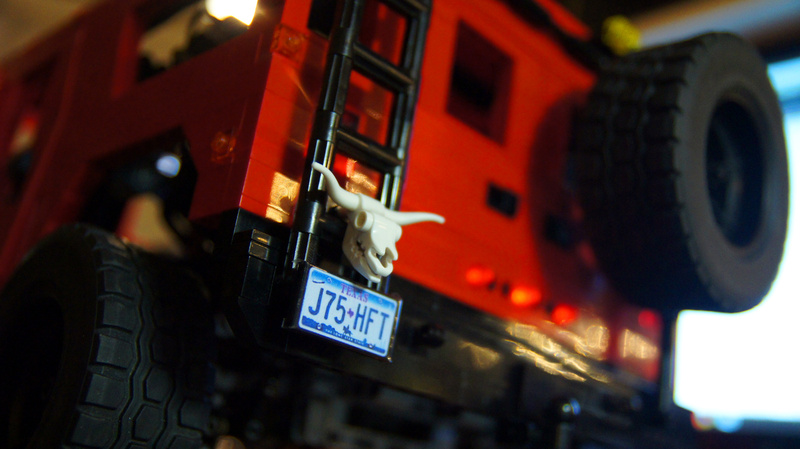 Ever since the 42021 Snowmobile set came out, with the new steering arms, I wanted to combine them with the Lego portal wheel hubs. 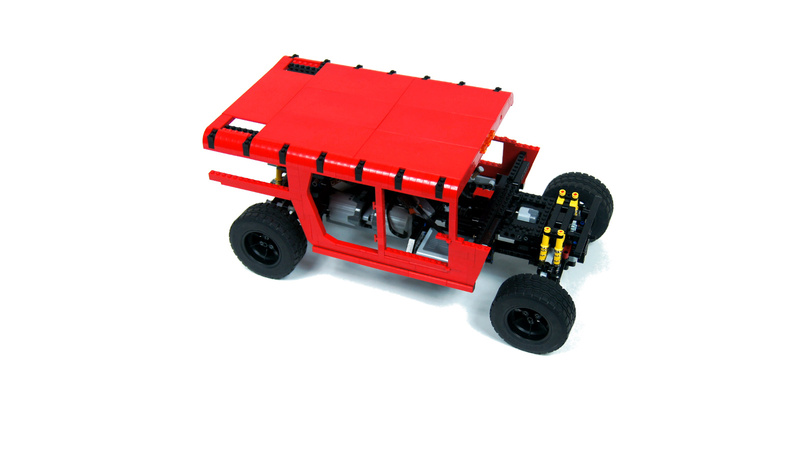 The result would be a proper, robust portal axle with independent suspension, something I have tried to build using less specialized pieces in my Humvee, but failed. 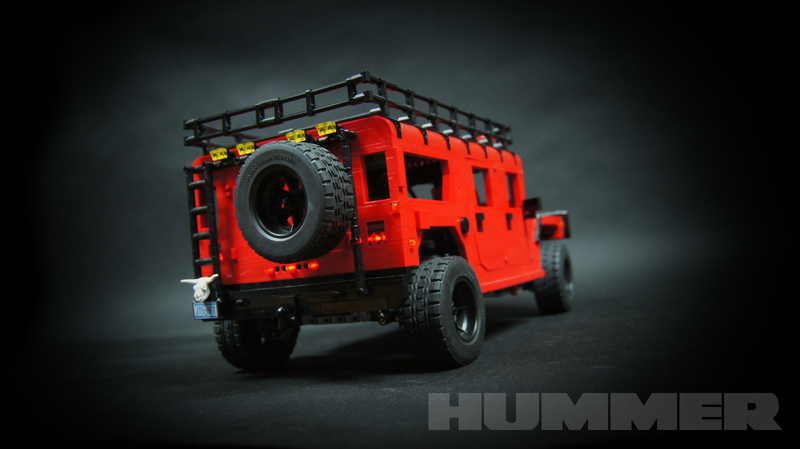 Of course, such an axle would be wide, and there is only one very wide vehicle with portal axles and independent suspension that comes to my mind: the Hummer. 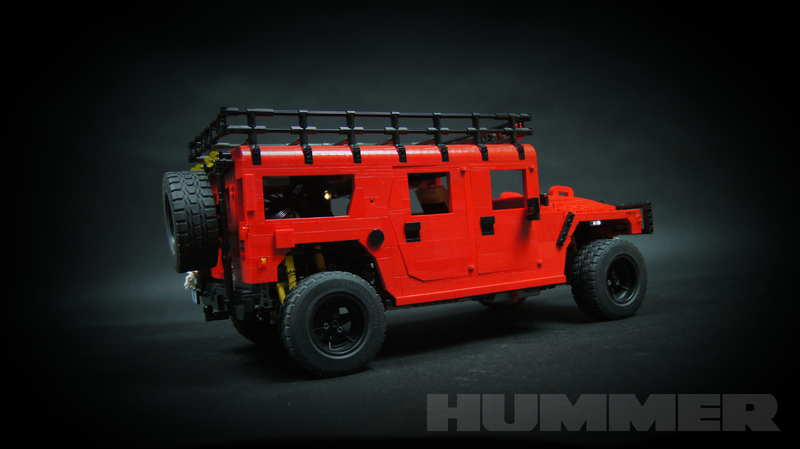 I have built two Hummers before, in 2010 and 2011, but seeing as they had their flaws, I decided to give it a third, final try. 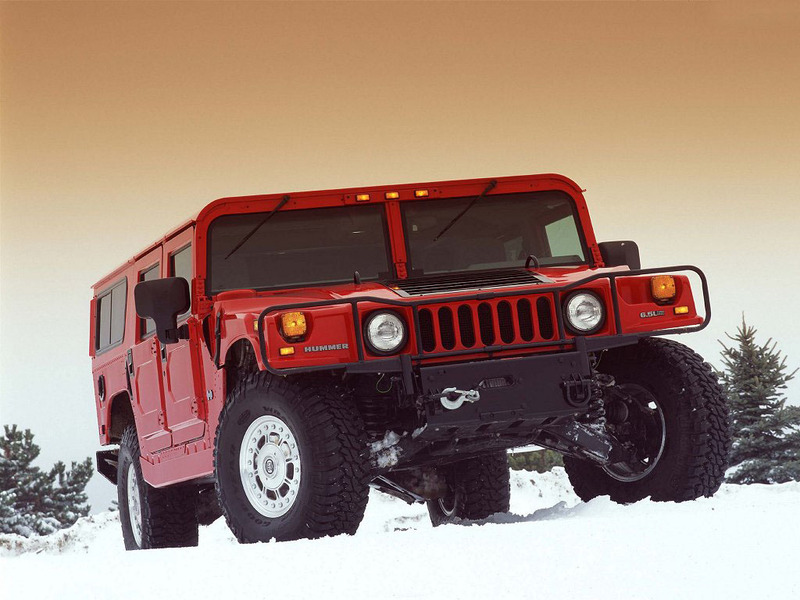 Which also happens to mark 30th anniversary of introducing the original Humvee, which comes off the same assembly line as the Hummer, into service. 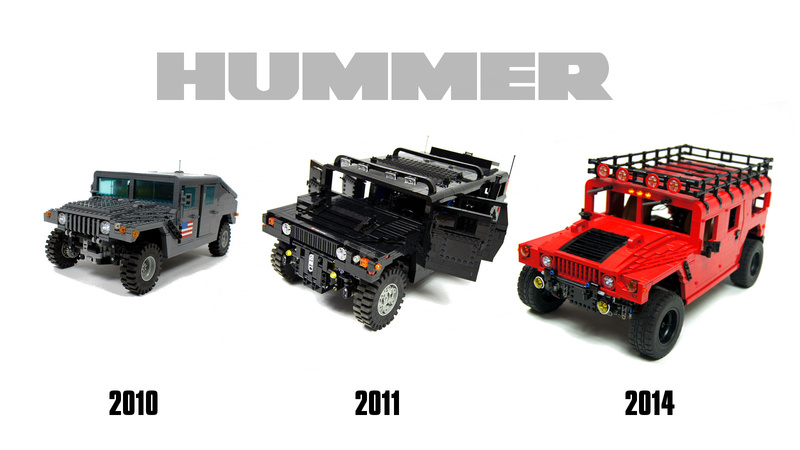 Incredibly, after 30 years the Humvee is still being produced, with 10,000 units deployed in Iraq War alone – while the Hummer went out of production in 2006. 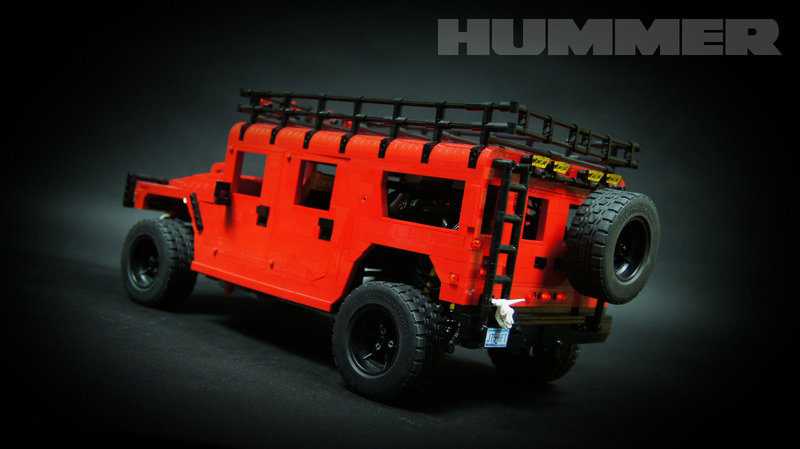 The model was built with two goals in mind: to look better than the two Hummers before it, and to drive better than my last large-scale off-road model, the Dakar Truck. 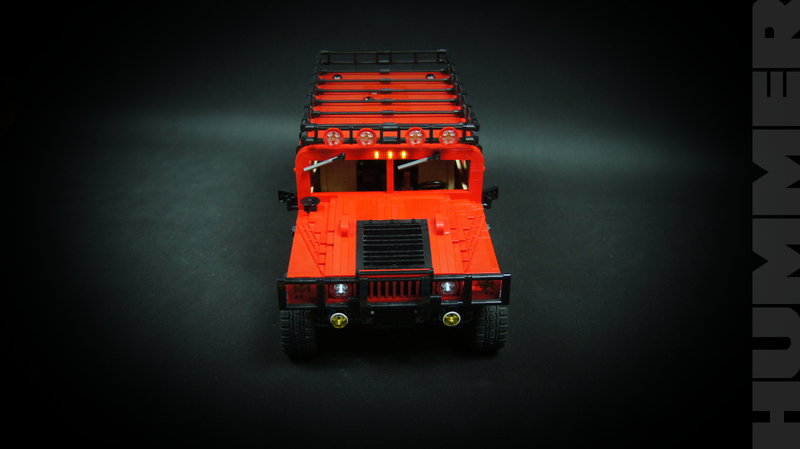 Large scale enabled me to include some details that were missing from earlier models, while using PF system instead of the RC one made sure the model had plenty of torque needed for off-road driving. 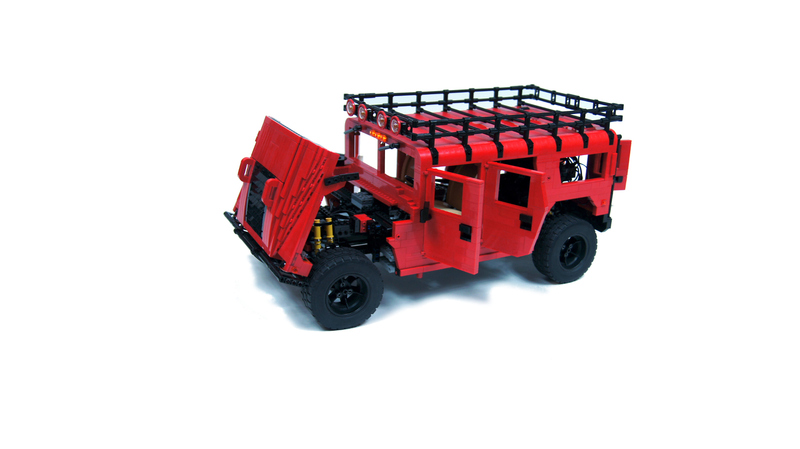 On the technical side, the model was built around a massive studless chassis, heavily reinforced to prevent bending despite the enormous wheel span. A simple 2-speed gearbox was located in front of the rear axle, shifted by a PF M motor using one small linear actuator. 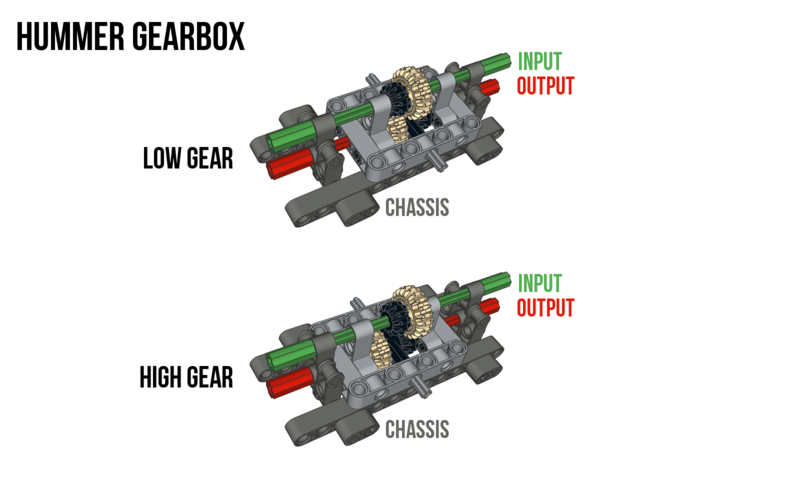 The input and output of the gearbox remain fixed, and it shifted by simply forcing double bevel gear wheels to slide along axles. In front of the gearbox were the four hard-coupled PF XL motors, two of which had their directions inverted by a PF switch to reduce the number of gear wheels required. In front of the cabin, below and between the front seats, were two PF battery boxes, each powering two PF XL motors, and a 8878 PF rechargeable battery powering everything else. 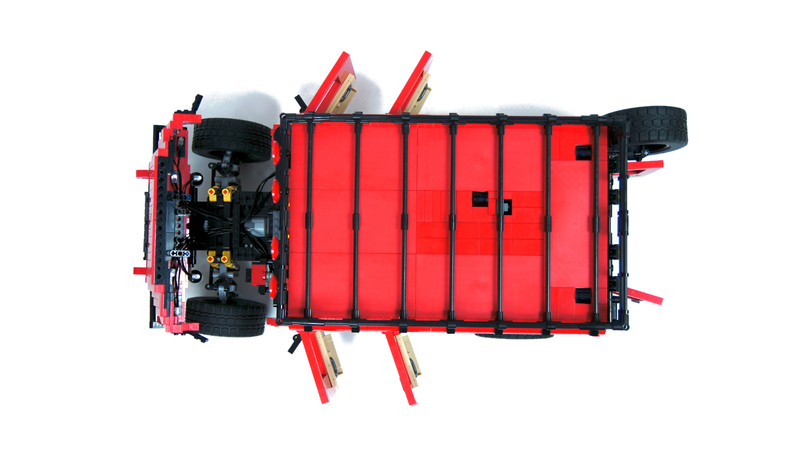 Such location of the battery boxes improved the weight distribution, which was impaired by the very rear-heavy Wagon body. The body itself, while massive in appearance, was actually just a thin shell attached around the studless frame. It was actually quite delicate, full of windows and doors, and it was simply sitting on top of the chassis, not bearing any loads. 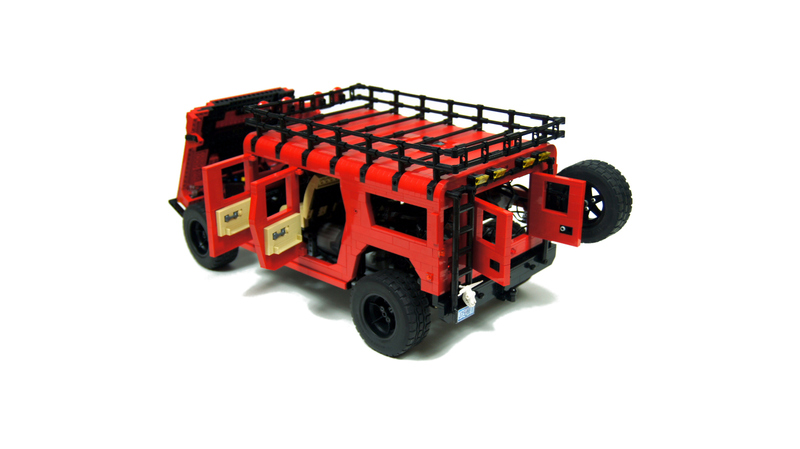 The entire model was held together by chassis alone, which was robust enough for the model to be picked up while holding just front and rear. 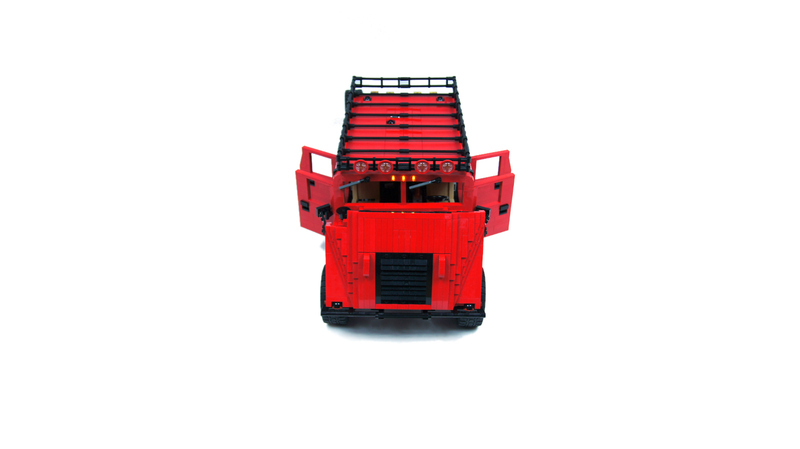 The body included four opening doors, hood and a trunk with two doors. The interior was simple, with some tan detail on the doors’ inside, and with two tan seats taken straight from my 2010 Dodge Challenger. The suspension system relied on the steering arms attached to portal hubs in “upside down” position – that is, the upper arm is facing upwards and the lower arm is facing downwards, exactly the opposite of standard design – and being spaced 3 studs apart, which improved stability of wheels, as the hubs were attached to the arms near their topmost and lowermost points. 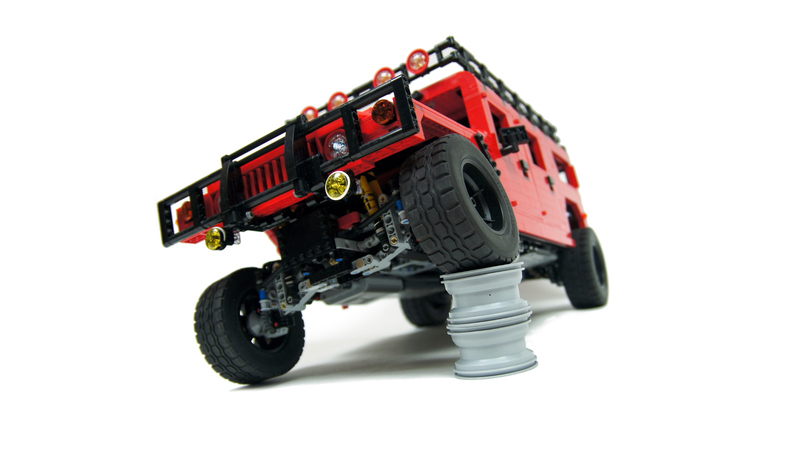 It wasn’t easy to balance such a heavy model with a rear-heavy body on an independent suspension. 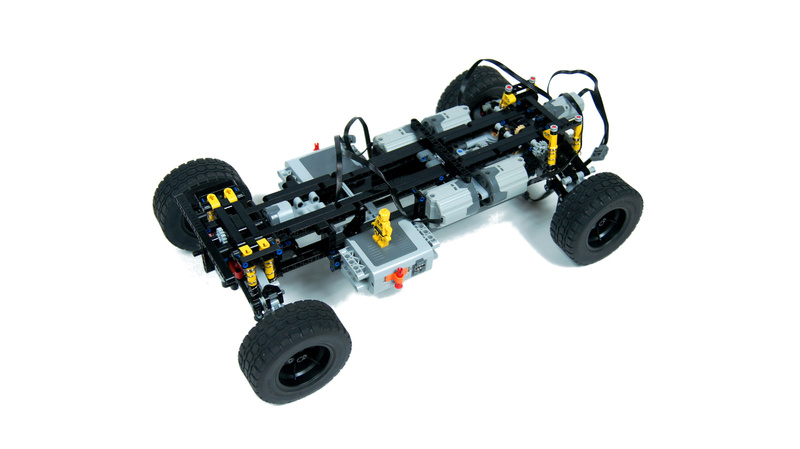 In the end, the front and rear suspension assemblies varied a lot, with the rear suspension being supported by additional four short shock absorbers. 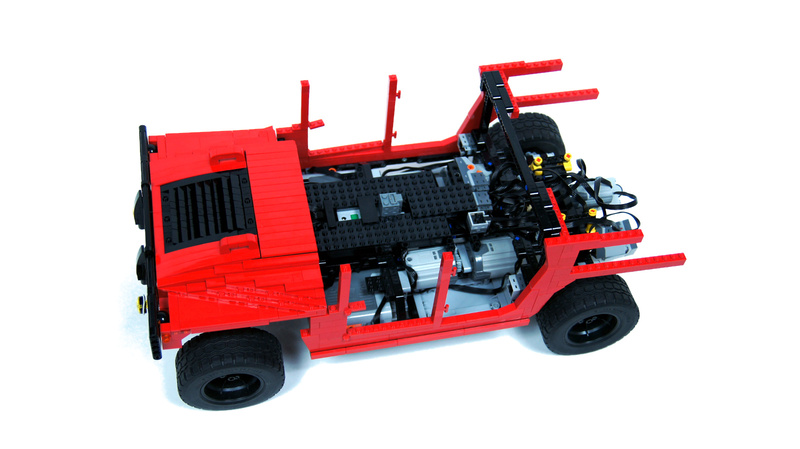 The steering was controlled by PF Servo motor located under the hood, and coupled with a micromotor rotating the steering wheel. The model was so heavy, the PF Servo struggled with the return-to-center function even on flat floor. 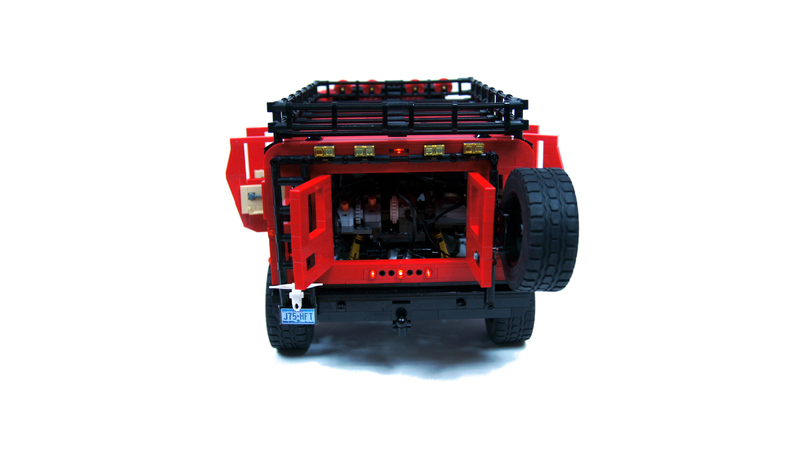 Other functions included motorized windshield wipers, automated turn signals and automated reverse lights. 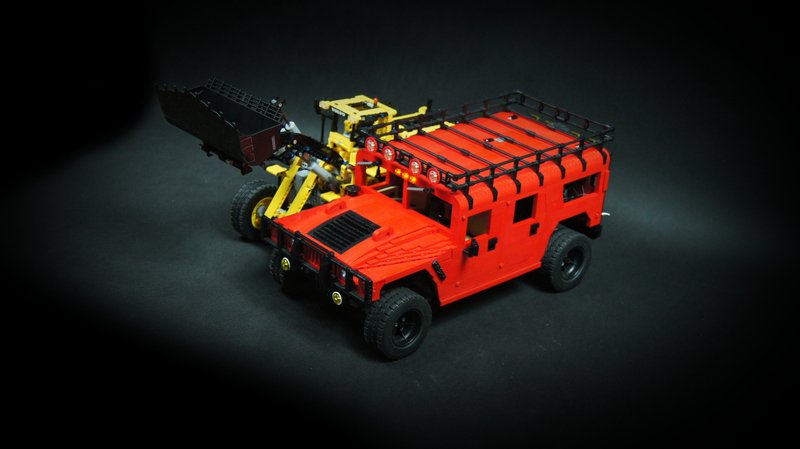 The last two functions were controlled by a single PF M motor each, using a number of PF switches, exactly the same way as in my old Tow Truck 2. 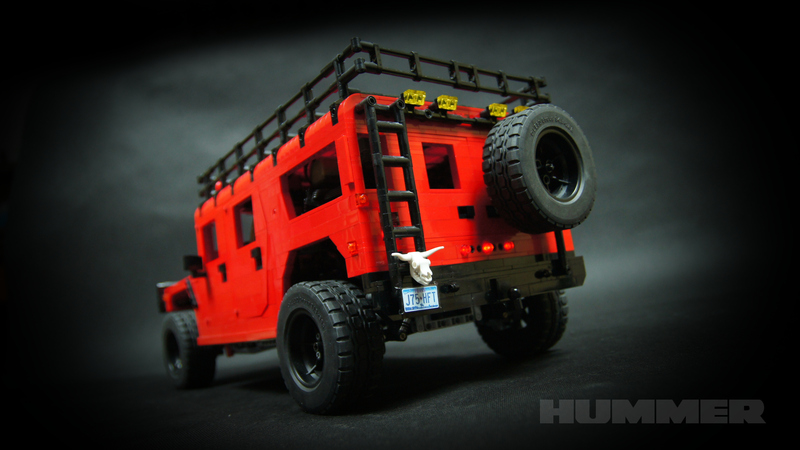 The interesting this about the original Hummer is that it’s not as simple as it appears. 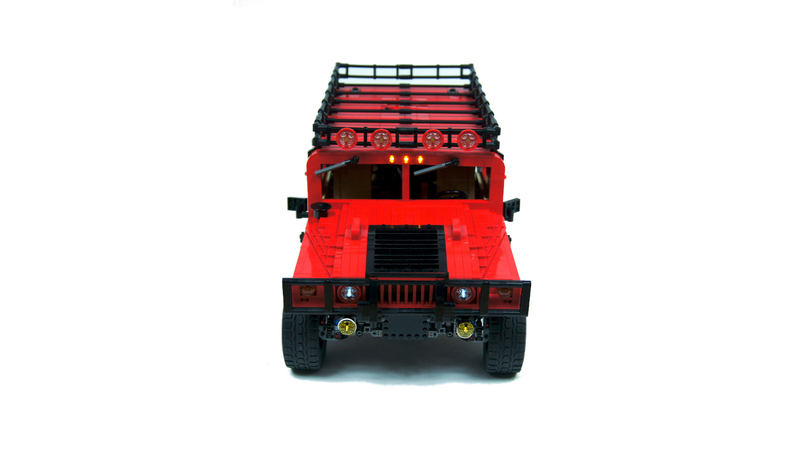 Upon closer inspection, one discovers that the sides of the body are slightly tapering upwards, that the lower edge of the body sides is slanted near the rear wheels, or that the rear windows reach all the way up to the roof, and are topped with arches whose shape doesn’t match any existing Lego pieces. 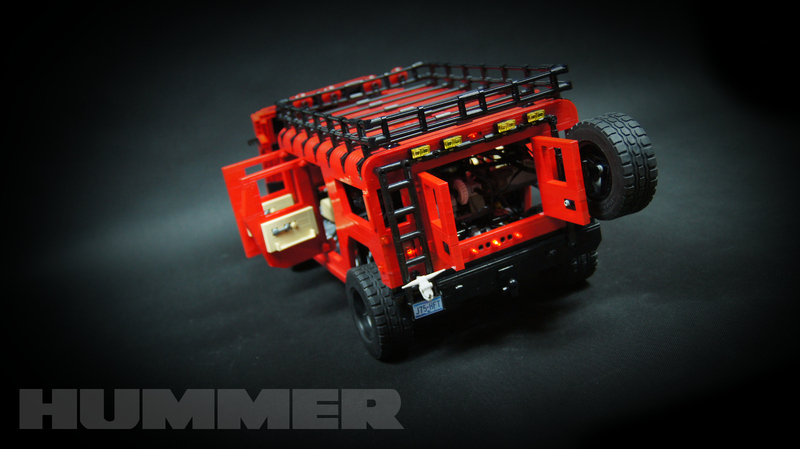 These were the details I was forced to omit because of how the body was built and how it was attached to the chassis. 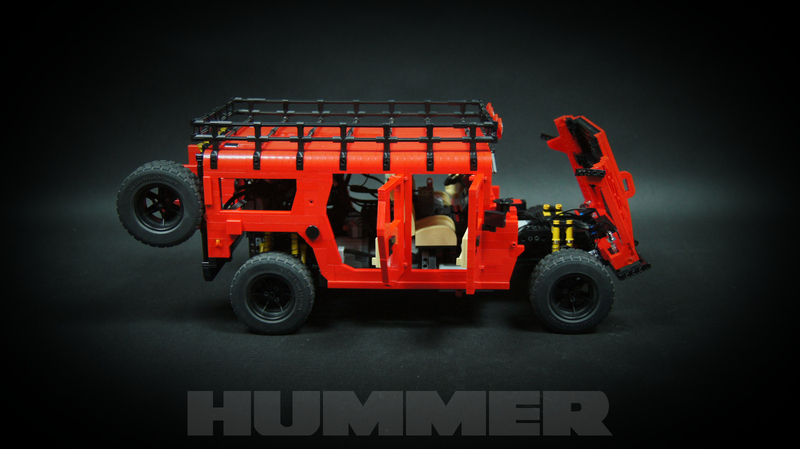 Also, there was a studless frame behind the second pair of doors, to which the body was attached, and it forced me to move the rear side windows further away from the doors, and to ignore the Hummer’s indented fuel inlet. Modeling the inlet required building “into” the body, and it was not possible with the body being just a thin shell with beams underneath. The finished model turned out much heavier and slower than I have anticipated. The high gear was intended primarily for driving downhill, and it was impressive that it could be used on flat ground, too. The low gear provided enough torque to tow the 42030 Volvo loader without much effort – however, an attempt to scale a curb damaged gears between the gearbox and the motors. 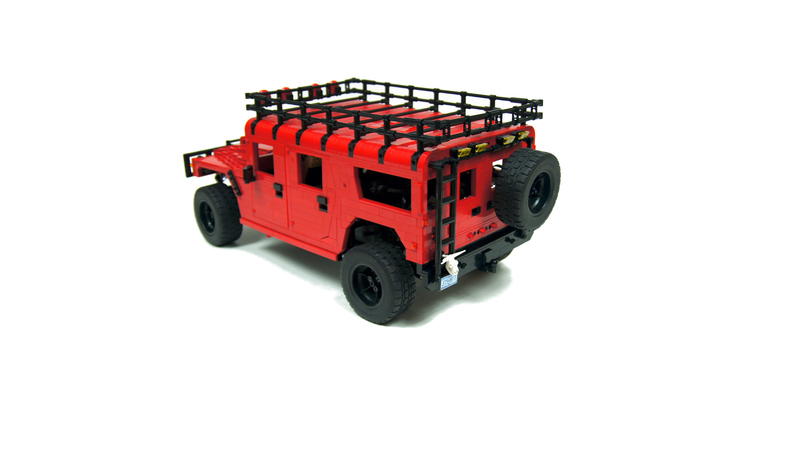 One of the problems with this model was that its sheer size and weight made it difficult to transport it far from my home, which is why I found no ground suitable for downhill driving. 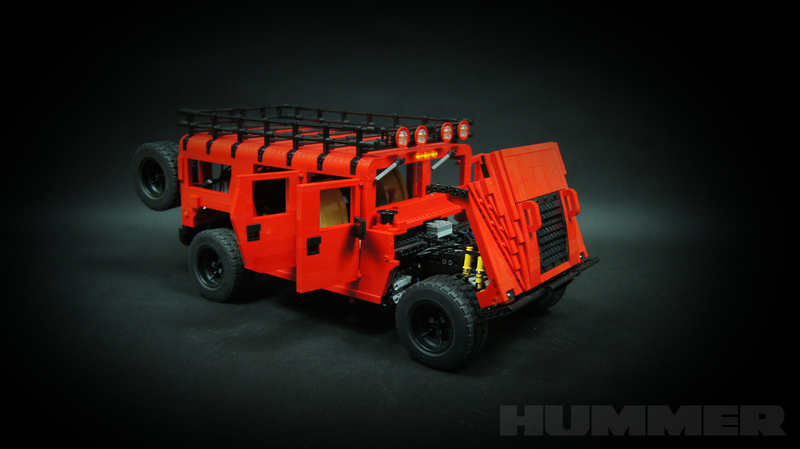 In the end, the model was sluggish, but good-looking and mechanically sound. 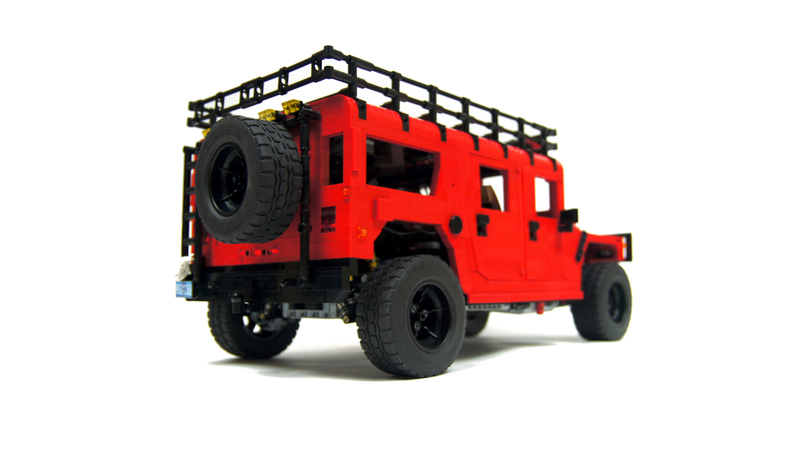 I was happy that it handled its immense weight without serious problems, and that the suspension, especially the front one, remained stable and functional under such weight, even when negotiating difficult obstacles. However, I consider it an argument against building heavy. Update: it appears that the Hummer was propelled by two, not four XL motors for most, if not all of the video. While taking it apart, I found that one 16t gear coupling two motors with another two is gone, together with the axle it was sitting on. There’s no trace left and I can’t find these two pieces anywhere else in the model. I have no idea where it went. The only efficient way to overcome it is to remove the differential. Use knob gears instead. Slightly odd thing to comment this question on, but I have been trying to find a way to overcome the ‘slipping gear’ in the differential. With all my heavier models, like this one, the gears slip when it try going up larger hills. How can I overcome this, is it as simple as lowering gear ratio, because im going pretty low now, and it doesn’t seem to work(it helps a bit). I am using 2x PF XL motors with Extreme NiMh Batteries in AAA battery box. Thanks for the Help! 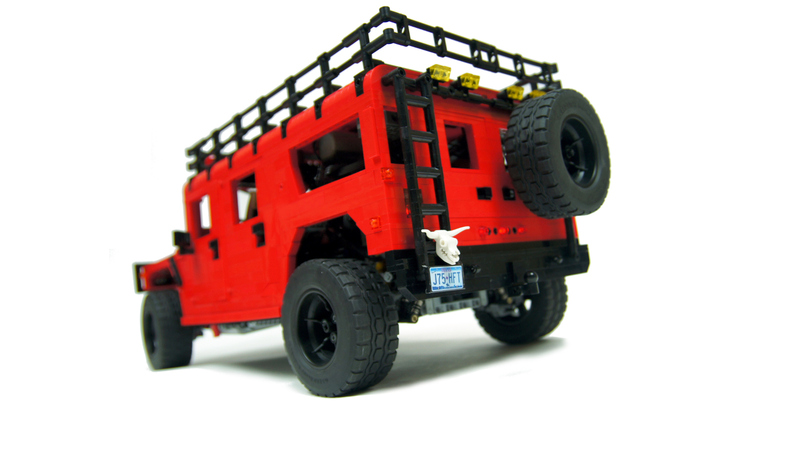 I recently found this lego hummer on the web, and it is very inspiring and AWESOME! 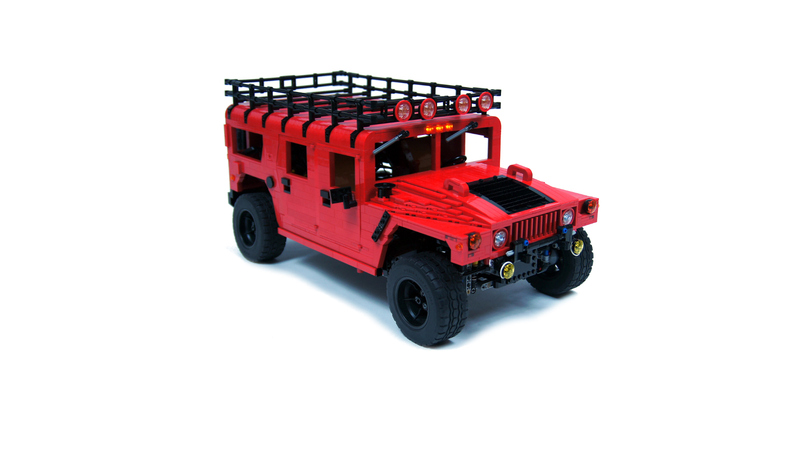 I want to build my own hummer and i was wondering if their are any tips you could give me, or features that will make the greatest lego hummer, that you would add to your hummer? 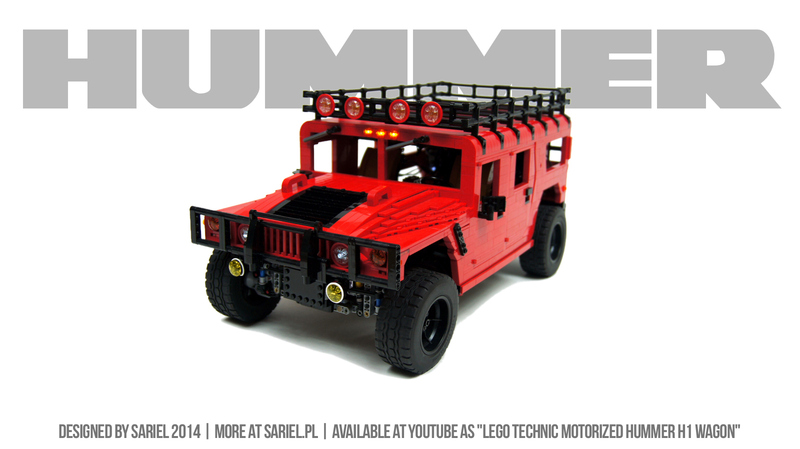 Hi Sariel, congrats on this and all your other awesome builds. You’re a huge inspiration even to more seasoned Lego fans such as me 😀 And thank you for sharing so much of your work. Cheers! They endure the torque because there is 3:1 gear reduction in wheel hubs, so the torque is effectively decreased 3 times. There is no real difference between u-joints and cv-joints in terms of strength as far as I know. 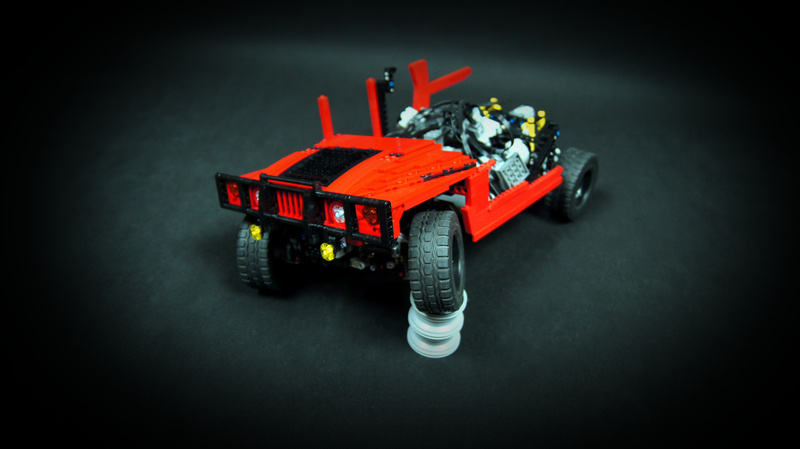 Sariel, what do you prefer U-Joints or CV-Joints? Which one is better for such heavyweight builds? 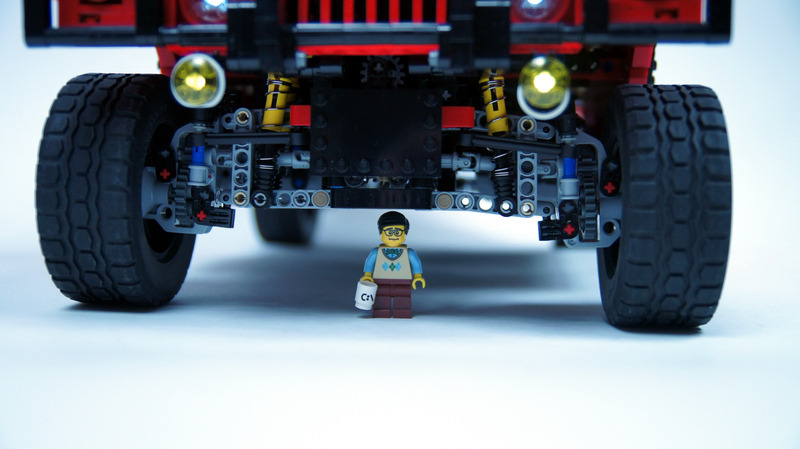 I could see in your images you use two pairs of 3L U-Joints for each axle. Do they endure the torque? Sorry, I forgot to add something. Of course the point where the brake system turns around or where the ball-joint-thing is attached has to be aligned with the ( imaginary) axle the wheel turns around. If nothing helps you could also try engaging the front brakes with small pneumatic cylinders. That’s the problem. When the steering turns, the brakes engage. Solution? Hope this helps. By the way: I’m trying to give my car’s front axle brakes, too, but this will require a redesign of the front suspension because it’s really not suited for things like this. Thank you a lot! Yes, it will be RWD. 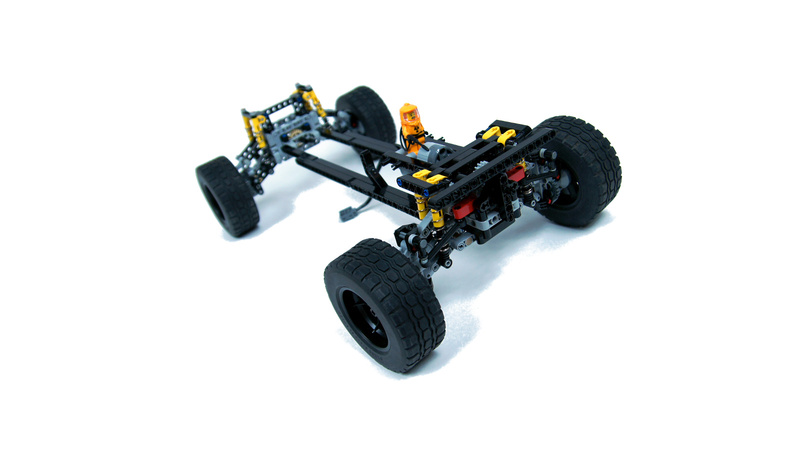 And I will try to integrate the brakes, altough this will require chnaging front and rear suspension a lot. Will your model be RWD? About the brakes, they are simple for a dependant axle, but in order for them go work on an independent axle, the lever (from the chassis, along the beams on the suspension, and finally to the brake disc, will have to be the same length as the beams that move when the suspension rises (what they are called, I don’t know). Sorry about that. You see, it is a really big model of a bmw 325i E30 scaled to 8110’s wheels using a blueprint I found on The-Blueprints.com. 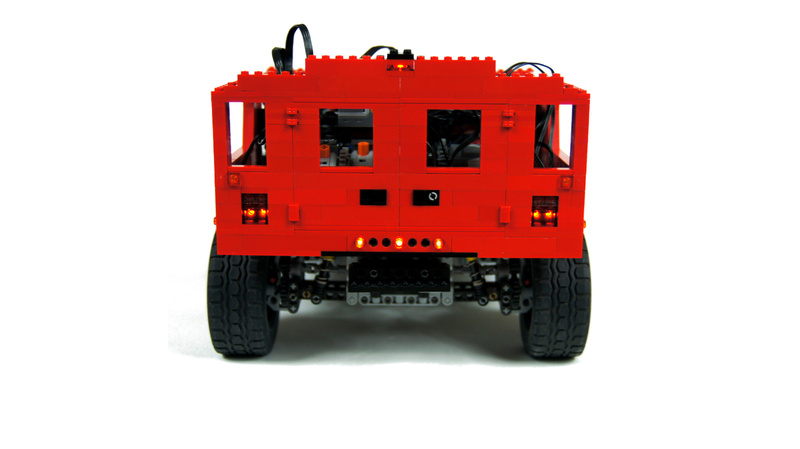 It will have remote – controlled drive and steerig, lights and two extra functions. 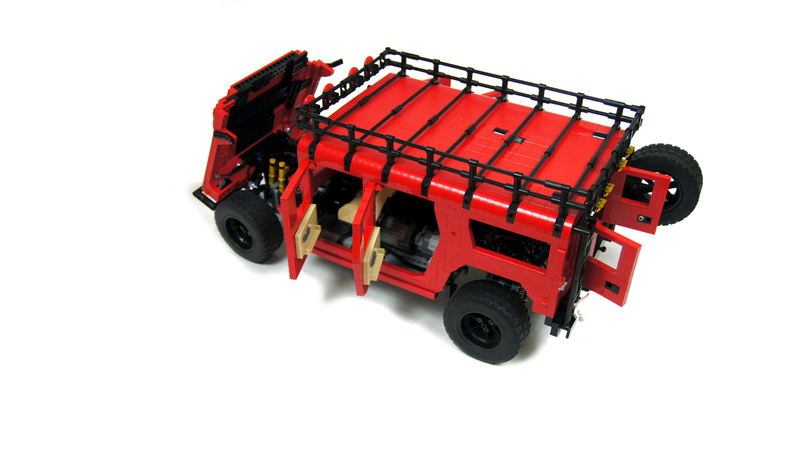 It will have one battery box, one 8878 battery, two Xl’s ,two m motors and some PF lights. 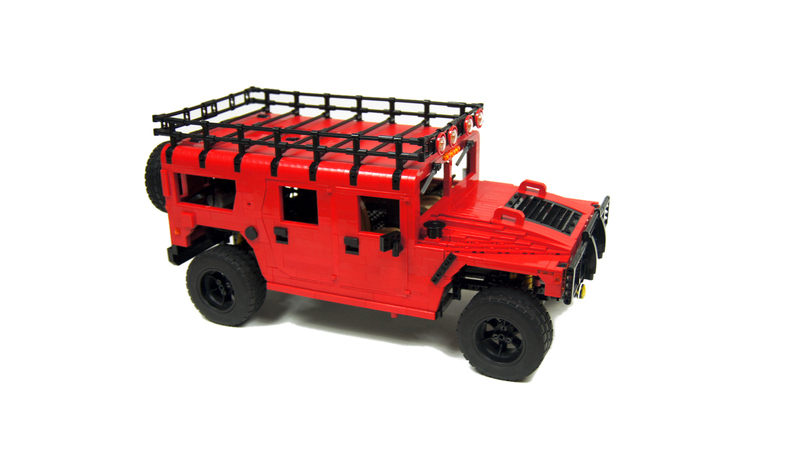 It won’t be as heavy as your Hummer, although it will be bigger, because it won’t have a full body but only the beams that give it a shape and hold it together without anything between them, so you can look inside it and see the mechanics 🙂 .This may seem weird , but I simply wouldn’t have the parts. It won’t have to drive fast or do any offroading, I just want it to get moving by itself 😉 . 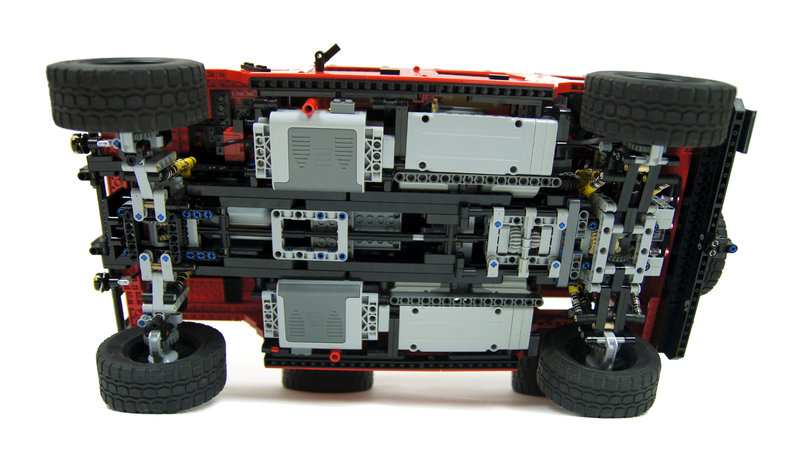 The two XL’s will be located near the rear axle, with both of them hard-coupled together and driving the rear axle 1:1 . 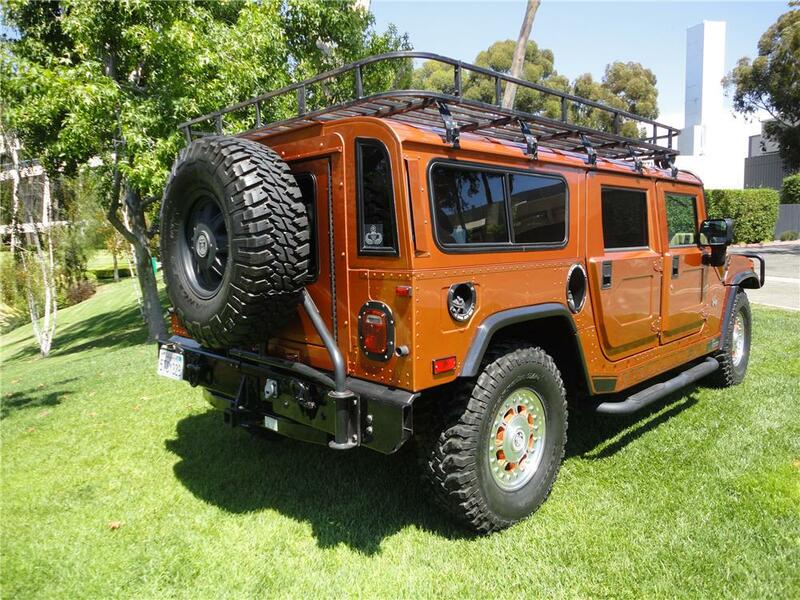 It will also have full independent suspension and ackerman geometry. I hope all this info helps you a bit. I can’t possibly know that. 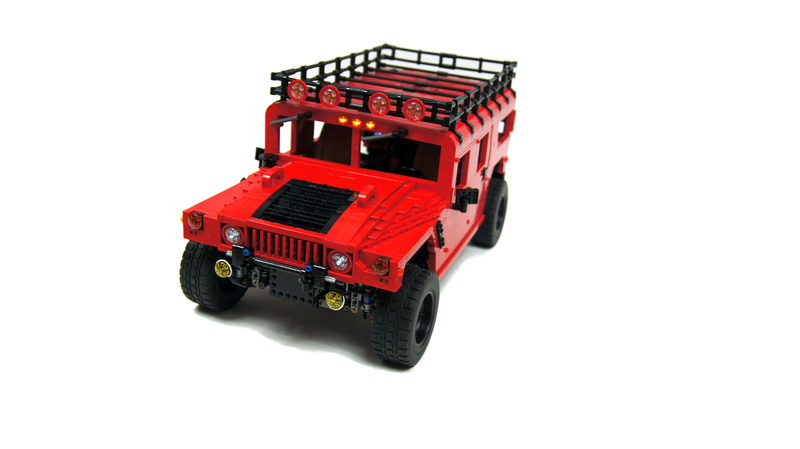 There’s a dozen of factors I don’t know about your MOC. Check Sheepo’s cars, they have disc brakes. Hi Sariel, what is the best way to put disc brakes on a steered and independently suspended axle? I’m thoroughly testing every part as I build. If I put shocks so close to something, you can rest assured I’ve checked the friction carefully. Thank’s for good answers Sariel. Brushes and touches and pretty much nonexistent. I gotta learn to be more pragmatic and less picky! I wasn’t expecting you to build it, just the theory would be nice. 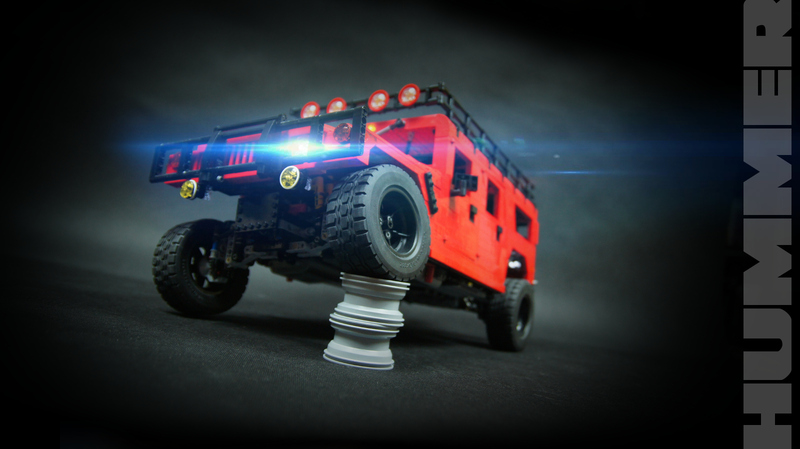 First of all, the first pictures show prototype front axle, it was changed later. 1. The steering link doesn’t touch the shocks, it only brushes slightly against the spring on shocks. 2. Bump steer is pretty much nonexistent here. 5L steering links are nonexistent too, at least official ones. 3. Yes, they touch steering arms but the friction between them and the arms is minimal. 4. I was using 16t gear without any problems. Whatever friction there was posed no problem to the Servo motor. I’m not sure how I can help you. 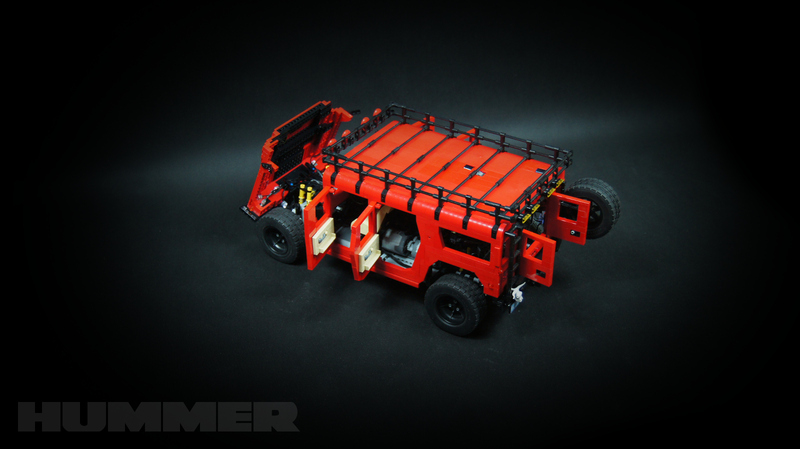 It’s not like I can build it for you and put instructions in the comment. 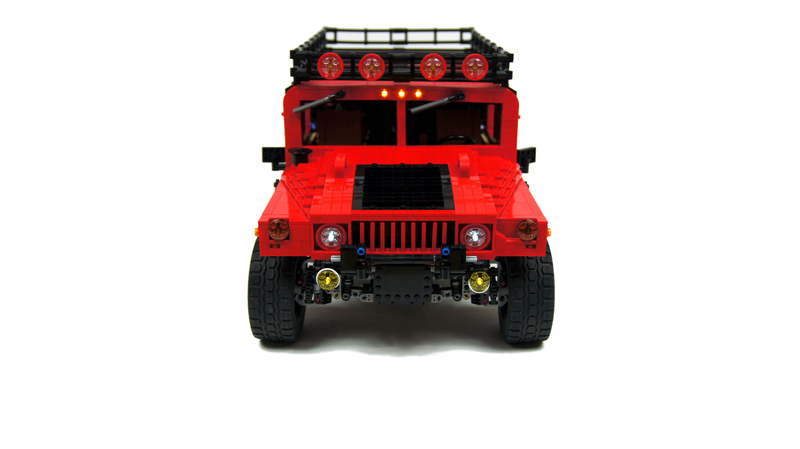 Hi Sariel, I don’t know where to post this, but what is the best way to put steering on a front axle (with drive, dependent suspension) using a ball joint? 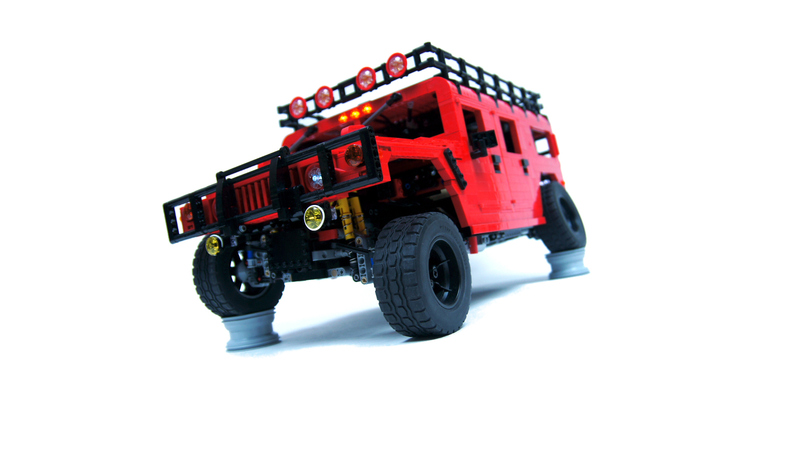 I have been trying to study your front axle of the Hummer, using the pictures on your website, so I had to guess a lot of course. Nevertheless I have some questions about the setup that perhaps you can help me with. 1. Neat Ackermann geometry but doesn’t the steering link touches (or more) the shocks? 2. 5L steering arms but 6L steering links. Bump steer but negligible? 3. Shock springs 9.5L extra hard(? ), touches steering arms as well? 4. 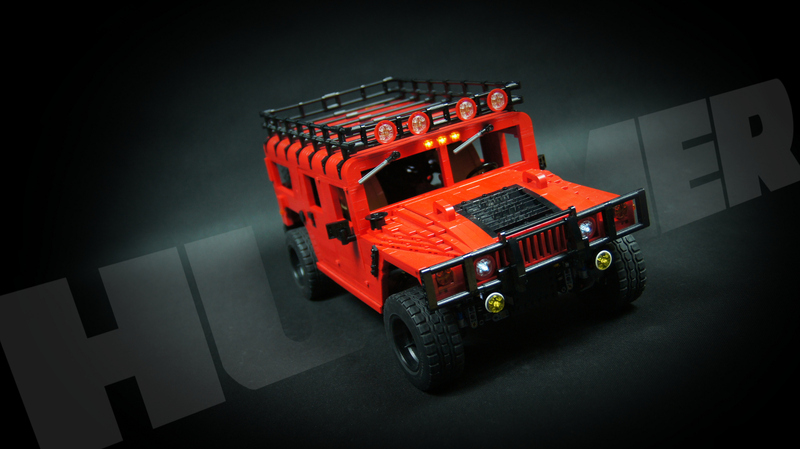 I cannot for the life of me build your rack and pinion setup. A 16t gear fits but gives friction. A 12t gear fits (with 3/4 pins below gear rack) but isn’t really compatible with the gear rack? Sorry, I don’t have more photos. Well, I like Volvo cars. Well, what car would you like to drive in real life them? There is no short answer, but there is a ton of info on differences in suspensions you can check, e.g. in Wikipedia or in my book. Don’t be lazy. Short version: independent = better performance, dependent = sturdier. So, what advantage does this give over dependent suspension in, say, a Land Rover?? 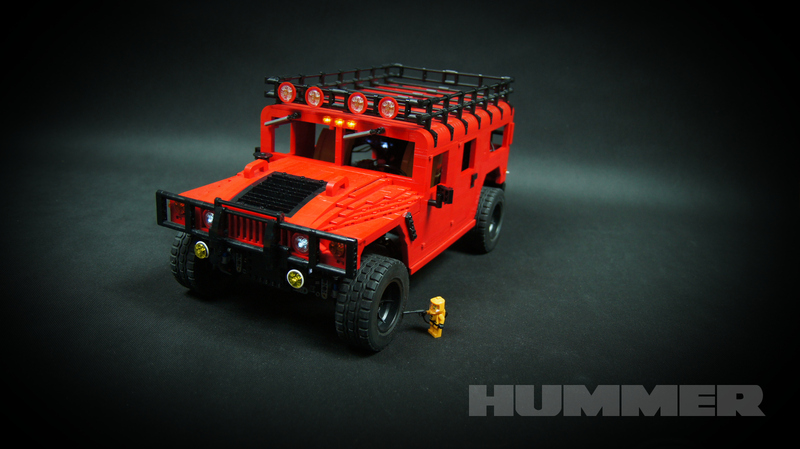 Would you like to have a Hummer in real life? No, no. 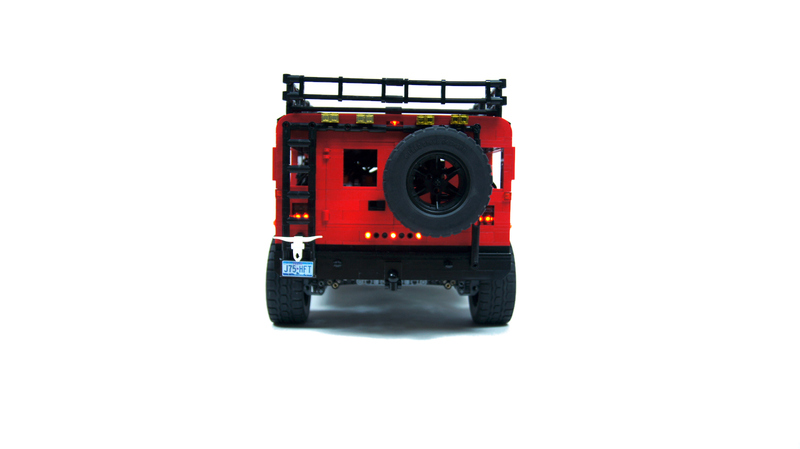 Hummers have independent suspension with portal hubs, exactly like this model. You could find it out by using Google for like 5 seconds, or by reading the model’s description, you know. 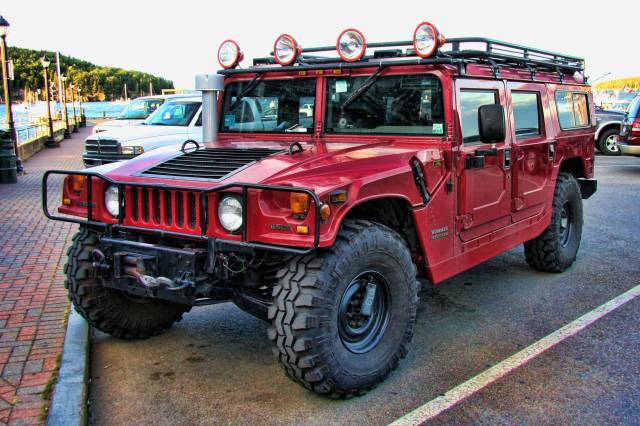 I thought Hummers had dependent suspension? The mechanism is shown in the video. The speed can be adjusted with PF speed dial remote. How does the motorized windshield wipers function work? Can the speed of it be adjusted? That depends on what you want. Studfull bodies usually allow more realistic look. Oh, ok, thank you I have always wondered, I have never made a car with a stud full body and have always wondered! Do you advise I make cars rather withe a studless/study full body? Lighter. Studless bodies are always lighter. 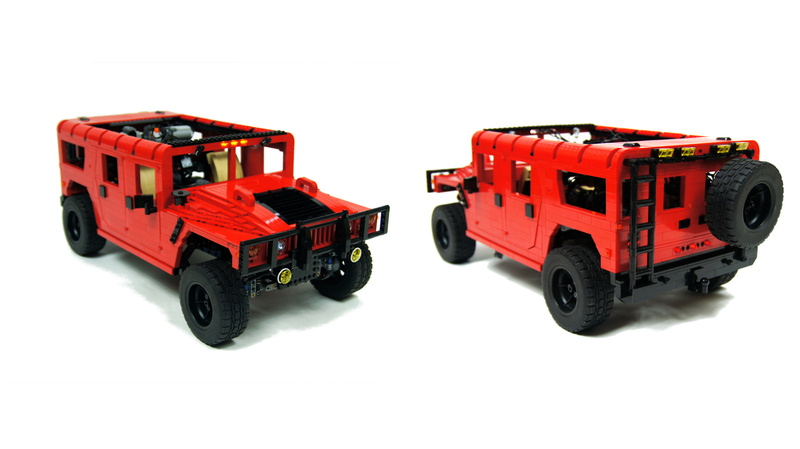 Thanks, Would the hummer be heavier or lighter with a technic body? The body is made entirely with studfull parts, as photos clearly show. Hi, The model you made, is the whole body studless or not? 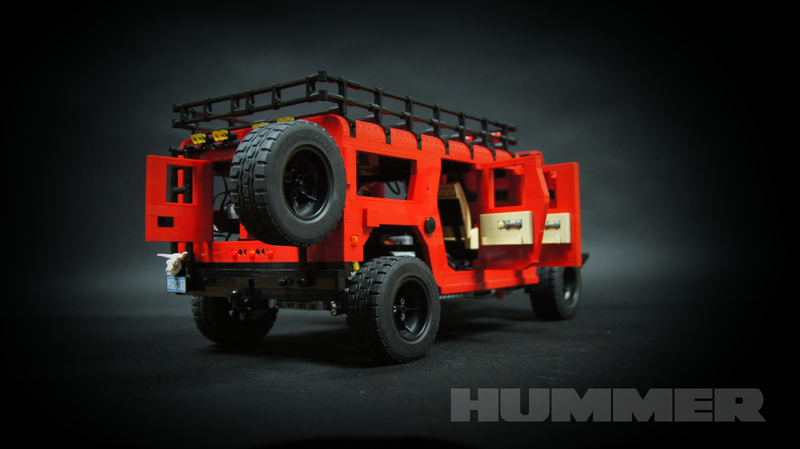 Not to be rude, but, I’m also making a Land Rover, the DC100 sport! I can’t wait to see what you come up with! Can’t wait for that! 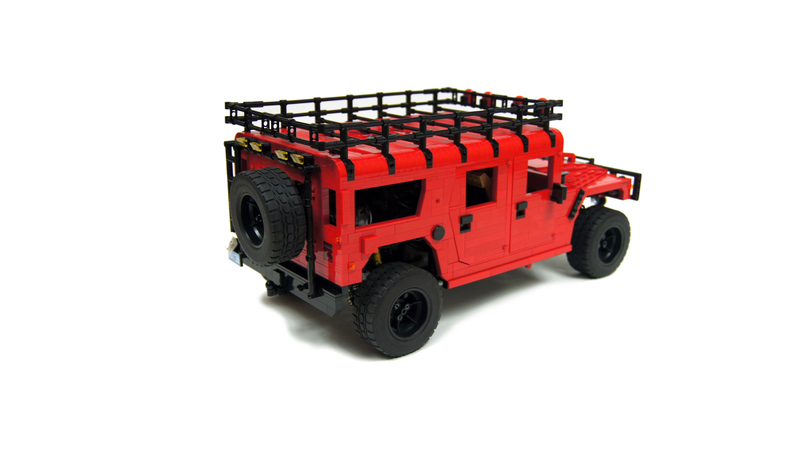 Am also working on a landrover myself, a little one, will be on eurobricks when finished. Love it! 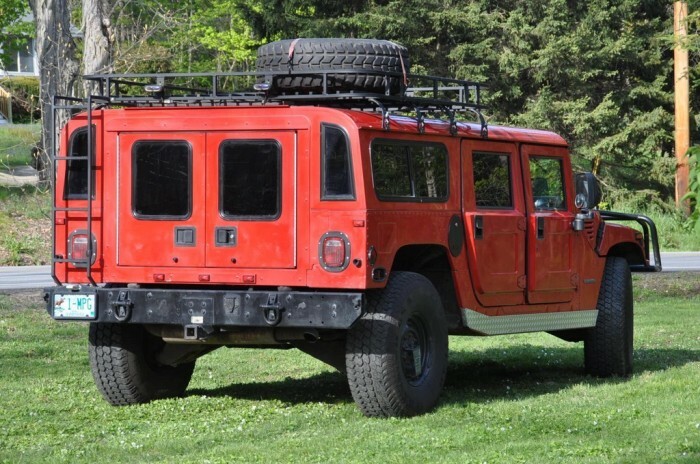 How were the outdoor/off-road performance with that extreme weight and with the (probably) two PF XL’s? 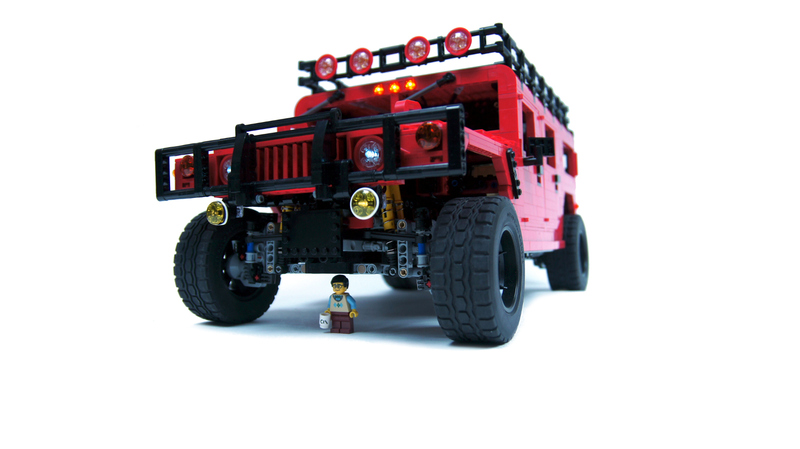 * I have a question: Are the large springs okay disturbing the suspension arms? Never. 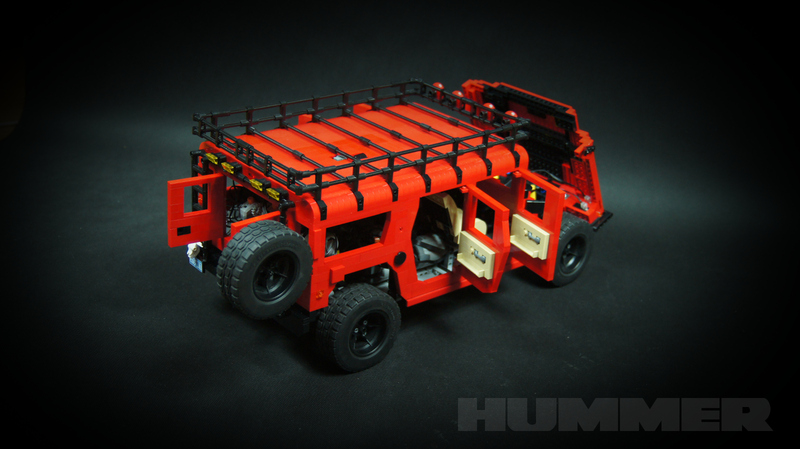 Lego Ideas is useless. 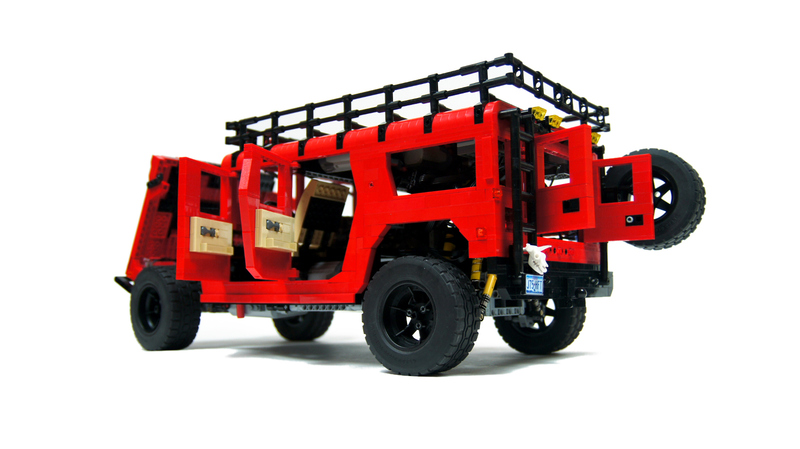 Can you do it on Lego ideas present here is the link https://ideas.lego.com/discover. Not really. Although a Medium motor with some gear reduction would provide tighter control than the Servo, I think. Are the steering wheels a bit wobbly? Sticking to one project at a time does not automatically mean faster building. Alternating between projects, on the other hand, prevents me from getting tired or bored with any of them. I just didn’t have the need to use it. Regular steering was sufficient, crude as it was. Great model yet again! Just curious, why didn’t you use the speed remote control for steering so you could’ve controlled the angle, as opposed to the regular controller? You said that the servo struggled even on flat floors to steer back to center. 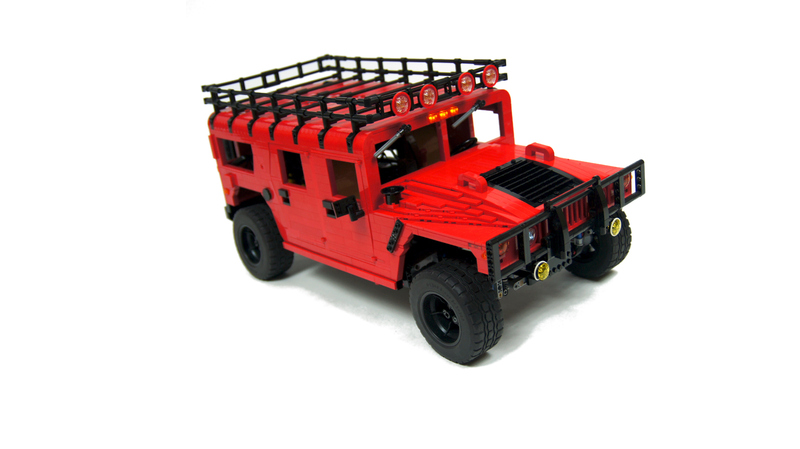 No, no, it’s up to you to decide what you build .I just inagined what a lighter hummer could do. So, you’re saying I should stop building any models and just keep making the same ultra-light, ultra-fast chassis again and again? @Sariel Yes I know but for me the loss of weight would make up for the looks. Wow!! 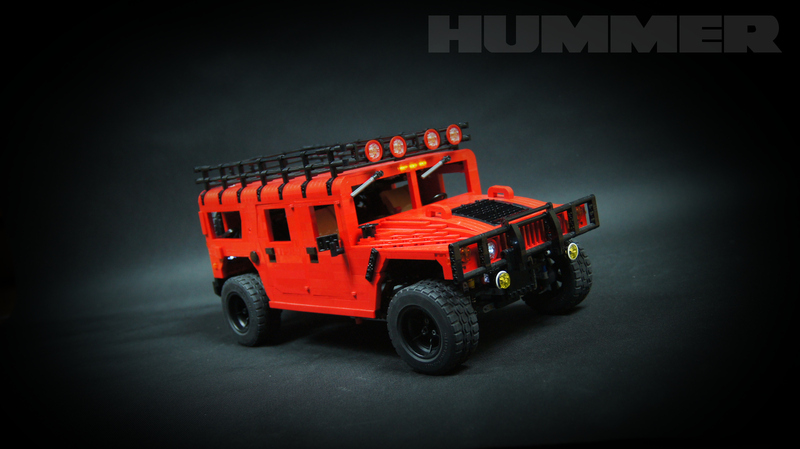 That is the best model Hummer I have ever seen. 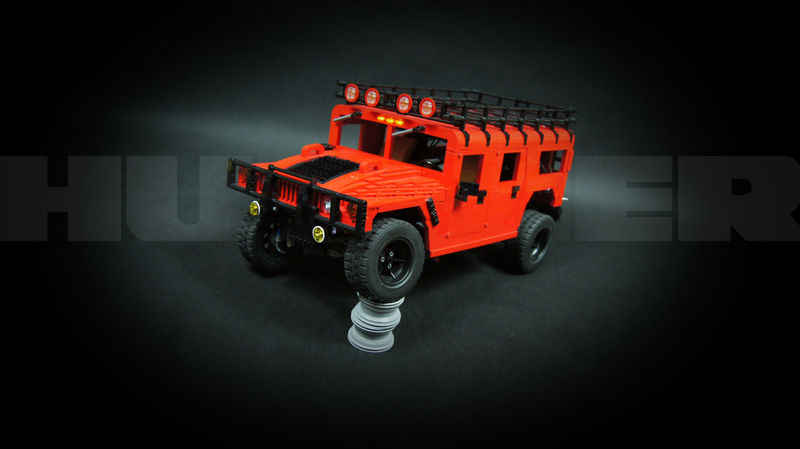 You have given me a great idea, and lots of inspiration to build a hummer I have been planing for a long time, but I don’t have any nic large wheels like you and have to do with the wheels from 42009. On the other hand with these photos and you book, no one knows what I will end up with. I have made a Range Rover Classic 3 door, and would like to here you opinion, and what you think I could change to make it look better? Can I email it to you? 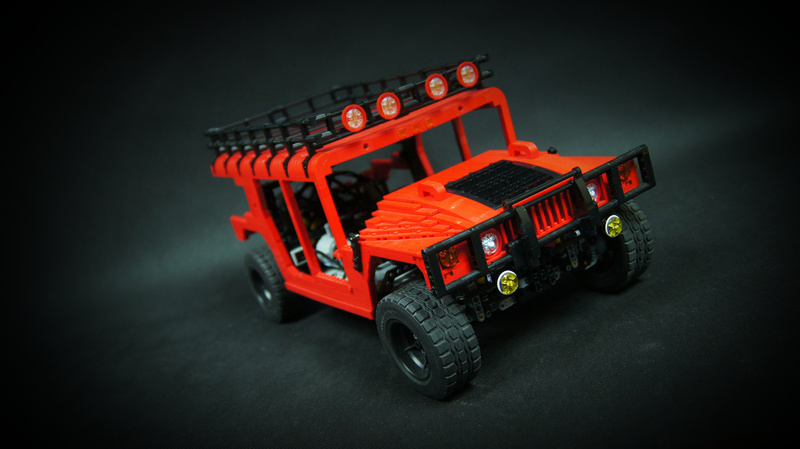 Imagine how great the naked chassis on Work in progress photo 2 would be offroad and how fast it would be on flat ground!Without all the weight it would be AMAZING! !